The R-PLEX Human MMP-9 Antibody Set includes a matched capture and detection antibody pair and calibrator for the quick and easy measurement of MMP-9 in biological samples. R-PLEX products leverage MSD’s electrochemiluminescence technology for better sensitivity and a larger dynamic range than traditional ELISAs. R-PLEX matched antibody sets enable the development of singleplex and multiplex immunoassays. Individual assays may be developed using MSD avidin- or streptavidin-coated plates. Custom multiplex assays with any combination of R-PLEX analytes, as well as R-PLEX plus U-PLEX analytes can be developed on U-PLEX MULTI-SPOT plates. To learn more about the advantages of R-PLEX products click here. 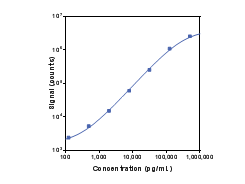 Calibration curve for the R-PLEX Human MMP-9 Antibody Set was assessed and representative data is presented below. Description - Matrix metalloprotease-9 (MMP9, MMP-9, GELB, CLG4B, MANDP2) is a member of the matrix metalloproteinase family of endopeptidases which are critically important in extracellular matrix remodeling. MMP-9 is a glycoprotein that plays a significant role in tissue remodeling, morphogenesis and cytokine activation. It degrades interstitial collagens, proteoglycan core protein, elastin and type IV collagen in the basement membrane. MMP-9 can also cleave several non-matrix molecules such as IL-1b, IL-8, platelet factor-4, GRO-a, and amyloid b peptide. It is thought that MMP-9 plays an important role in various disease processes, including cancer, rheumatoid arthritis and atherosclerosis. Biomarkers of lung epithelial injury and inflammation distinguish severe sepsis patients with acute respiratory distress syndrome. Higher levels of advanced glycation endproducts in human carotid atherosclerotic plaques are associated with a rupture-prone phenotype. Inflammation biomarkers in vaginal fluid and preterm delivery. Sarcoidosis, alveolar β-Actin and pulmonary fibrosis.